An entirely new kind of biography, Oscar s Books explores the personality of Oscar Wilde through his reading. It argues that reading exercised a formative influence on Wilde s character and was the inspiration for his own writings. For Wilde, as for many people, reading could be as powerful and transformative an experience as falling in love. He referred to the volumes that radically altered his vision of the world as his golden books ; he gave books as gifts often as part of his seduction campaigns of young men; and sometimes he literally ate books, tearing off corners of paper and chewing them as he read. 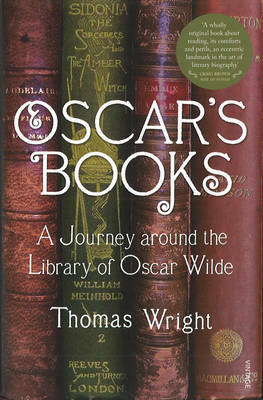 Wilde s beloved book collection was sold at the time of his trials to pay creditors and legal costs. Thomas Wright, in the course of his intensive researches, has hunted down many of the missing volumes which contain revealing markings and personal annotations, never previously examined. Of Anglo-Irish descent, Thomas Wright was educated at Saint Thomas More School, Bedford. Overwhelmed by The Picture of Dorian Gray in his teens, he applied for Magdalen, Oscar Wilde's college at Oxford, and was accepted; during his time there he occupied a room containing the fireplace that once stood in the library of Wilde's Chelsea home. He has frequently lectured on Wilde and written countless articles about him. He is the author of Oscar Wilde's Table Talk. Thomas Wright lives in Genoa and London, and sometimes writes about subjects unconnected with his hero.